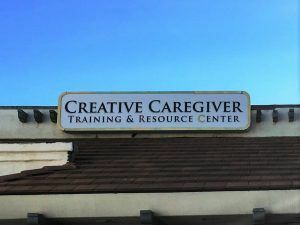 We were contacted by Creative Caregiver Training for some new sign faces they needed after they were referred to us. We were right down the street from them and as we were recommended to her, we were the first choice to help her update the storefront signage. As you can see from the photos, she was taking over two suites and each one had a box sign that she needed new faces for. Replacing a face on a box sign or cabinet sign is more cost efficient than other storefront signs like a channel letter sign or exterior dimensional letter sign. Depending on the artwork being used for the sign face, we can use cut vinyl or digitally print the logo and other information. We prefer to use cut vinyl as it is longer lasting, however, some things like artwork with a gradient or an intricate design will need to be digitally printed. For sign faces, we only use Tuf Glas. Tuf Glas is more expensive than regular sign acrylic, but it is much more durable as it will not shatter as easily as regular acrylic. Tuf Glas also comes in large rolls rather than sheets. This allows us to create one large sign face without a seam because we don’t have size restrictions. Some companies will use Lexan for sign faces, but we still choose Tuf Glas because Lexan yellows over time whereas Tuf Glas does not. When you get a sign face from us, you are choosing a high-end option that will last much longer and look much nicer than cheaper alternatives. Your signage is an investment and you want to make sure that you are getting a quality product from the beginning. Give us a call today if you’re moving to a new location or if you just need an update on your existing signage.